Explore the world of the tropical habitat of butterflies! Barely an hour’s drive away from Cairns; is this exotic world of butterflies, commonly known as Australian Butterfly Sanctuary. 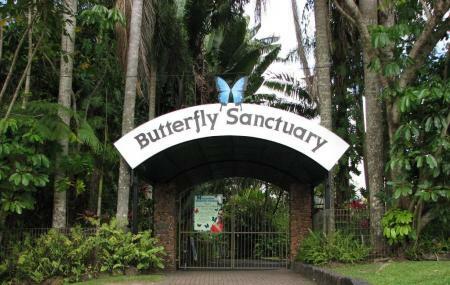 The sanctuary has been working for the last 20 years and is said to be the largest butterfly flight aviary in Australia. The serenity of fresh water flowing from the waterfalls and the tropical plants all around the place makes it a haven for butterflies. The sanctuary is also said to be the homeland of world’s largest moth-the Hercules moth. You actually need to see and believe this majestic creature of the nature. The guided tour ends with the visit to the air conditioned butterfly museum. Entry includes a free guided tour (not available separately), and a Behind –The – Scene Laboratory tour. The 4 Park Pass allow entry to Rainforestation, The Wildlife Habitat and Cairns Wildlife Dome, along with Australian Butterfly Sanctuary. The 4 Park Pass is ideal for families or self drivers. Guided tours through the aviary and laboratory are conducted, throughout the day. How popular is Australian Butterfly Sanctuary? People normally club together Skyrail Rainforest Cableway and Palm Cove, Queensland while planning their visit to Australian Butterfly Sanctuary. Fun watching the large variety of butterflies fly all around you. Fun facts posted about, and a butterfly guide is available if interested. There is a room where the cocoons and caterpillars are kept for future butterflies. Nice way to spend an hour while in Kuranda. Butterfly Sanctuary was worth a visit especially for young children Guided tours and many species of butterflies to see here as part of a tour we were on. Happy to have visited this sanctuary but make sure you take the guided tour to get the knowledge. Such a beautiful spot with a wonderful team, we were really lucky as we got to have a tour all to ourselves but it is a beautiful area with a great experience. Great for kids and it isint a huge area so quite easy to navigate. Loved the experience and would happily take our kids back! Lovely peaceful informative place. Can just sit and have butterflies flutter past you or you can wander through the paths viewing and answering the questions on the way. Throw a coin in the pond and make a wish then move on to the butterfly nursery. See the world as the butterfly does. This was our second visit tho quite a few years apart still thoroughly enjoyed it. They of course have a nice selection of souvenirs in the shop. Best place to visit when in Kuranda. Loved the free guided tour, very informative and an awesome collection of butterflies and moths. I think everyone should visit the Australian Butterfly sanctuary.